Christmas is once again on its merry way and festive markets have started opening to visitors across Britain. It’s time to brave the chill and start your seasonal shopping, so whether you fancy some ice skating, are on the hunt for handmade gifts or simply after some traditional bratwurst, here’s a list of the best markets to get you in the festive spirit (if you aren't already). Bath’s Christmas market was voted UK’s best festive market in 2017 by the National Outdoor Events Association (NOEA) and it's not hard to see why. Every year, its picturesque streets are filled with more than 180 traditional stalls and chalets selling locally-made goods. This year, you can expect to see decorated wooden chalets lining the streets with merchants selling a wide range of products – more than 80% of them from Bath and the South West. Located along Coppergate, St Sampson Square and Parliament Street, the St Nicholas Fair in York is a lovely place to get into the festive spirit. The free event has traditional Alpine chalets selling locally made goods and a funfair complete with traditional helter skelter. When you've done enough shopping, be sure to head to the Made in Yorkshire Yuletide Village and the Yorkshire Barn for authentic British foods and drinks. 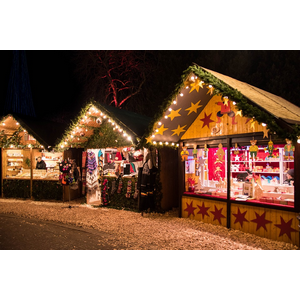 While London is spoilt for choice when it comes to Christmas festivities, Hyde Park Winter Wonderland and Southbank Centre Winter Market are a great place to foster some seasonal good cheer. If you’d like something different, head to Christmas By The River at London Bridge, Leicester Square Christmas Market, Winterville in Clapham or Greenwich Christmas market. The Frankfurt Christmas Market in Birmingham is the biggest German festive markets held away from its homeland. You can soak up the atmosphere at Victoria Square while enjoying a range of delicacies including roasted almonds, bratwursts, schnitzels and pretzels. There’s also gluhwein and weissbier to wash down the traditional bites. If you need a break from shopping, have a skate around Centenary Square ice rink or view Birmingham from above in the Big Wheel. This Scottish-themed market along St Andrew Square and George Street wraps up our list of the best Christmas markets in Britain. It is well worthy of a yuletide visit as it has a host of activities taking place well into the New Year. Expect artists, crafters, traditional stalls, culinary delights, bars, and silent discos. We hope this list of the best Christmas markets in Britain will get you to wrap up warm and make the most of your weekends.